A biomass waste conversion company was using a progressive cavity pump to process waste. This demanding application was wreaking havoc on the cavity pump causing excessive wear of the pump’s mechanical parts (seals, rubber stator, rotor assembly) and significant downtime. The company was spending approximately $11,000 to $18,000 in maintenance fees per month to maintain the cavity pump. Consequently, the company began searching for a better solution that would meet its application needs while lowering costs and improving efficiencies. The Abaque Peristaltic Hose Pump (model HD100) was customized and installed to facilitate transfer of the bio-organic waste into numerous digestion units for processing. 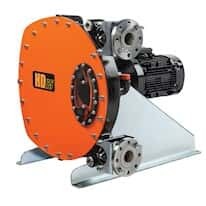 This pump operates at a flow rate of 520 LPM and a speed of 20 rpm by way of an inverter drive at 25 Hz—transferring up to 33,000 tons per year of organic waste. This pump has none of the usual parts that create problems on other pumps such as the seats, valves, and mechanical seals. The hose is the only replacement part, thus virtually eliminating maintenance and downtime. After only two months, the company recovered the costs of the hose pump and installation. The company also has the potential to save over $200,000 per year now that continuous pump maintenance and significant downtime have been eliminated. The efficient processing of the bio-organic waste is enabling significant release of biogases which are being used to produce up to 1.5 megawatts of electricity—enough to power up to 2,000 homes . Learn more about Peristaltic Pump Custom Ordering and other OEM design capabilities for peristaltic pumps.